I recently attended the Remarkables Ice & Mixed Festival, held in Queenstown on the famous mountain range. To be honest – only the “ice” part of the name really appealed, having just come back from Canada after doing some incredible winter climbing on their magnificent waterfalls. As I contemplated attending the festival, I recalled being on a top rope in the Canadian Rockies, scratching tools on blank, vertical rock with my arms screaming at me, failing in an effort to master the art of mixed climbing. The whole concept of tools on rock seemed strange to me outside of moderately angled mountaineering situations, but I gained an appreciation for how difficult and out-there technical mixed climbing actually is! The Wellington Section decided on flying to Christchurch and then taking a minivan to Queenstown, which turned out to be a great idea compared with taking a ferry across the gap and driving the whole way from Picton. The drive on the way was breathtaking, especially through Tekapo – getting everyone super excited for the climbing ahead. What an awesome crew of people. We shared climbing stories, gear reviews (my favourite) and my stash of scroggin that was definitely going to last the whole trip was done in 20 minutes! Opening night at the Queenstown Event Centre was a great way to meet a few of the other climbers, but I seriously have never seen so many down jackets in one room. It is always so great to be amongst fellow climbers. They just seem to be so much more down to earth than “normal” human beings and chatting with others about their future climbing ambitions always leaves me inspired and wanting to quit my job, buy an outrageous amount of 2-minute noodles, get on the road and live the dream again. I teamed up with Eric on the first day of the Festival and we made our way up the ski field underneath the lifts over to the Remarkables West face. As we hiked up the hill, I came to the conclusion that jumping and hooking ice tools to the bottom of the chairs and hanging on would definitely work. Might help me get ahead of the pack on the Traverse for next year and actually complete it in a day. Anyway, after a bit of careful traversing on soft snow we arrived at a crag on the west face and decided on a tasty looking line up the face, which we thought was grade M4, or was it M6+? “Ah f**k it, lets try it anyway, we can always come down”. Eric stepped up and took the leads for the day with me following, good lad. He made some pretty bold moves in areas with really blank rock and a serious lack of good ice where I imagine there normally would be. Despite my attempts at being a delicate climber, a whole sheet of ice covering a slab broke off on me. The revised beta involved me performing probably the most uncoordinated chimney in the history of climbing – with legs fully parted at an angle they didn’t even know existed. I made a promise to myself to start doing yoga as soon as I got home. I’m going to yoga tomorrow, for sure. On the third pitch we ended up simul-climbing due to lack of good protection, which spiced things up a bit. We chose a slightly different approach than the line mentioned in the guidebook due to it not looking in the best of condition and ended up at a pretty out there move on the alternative line. 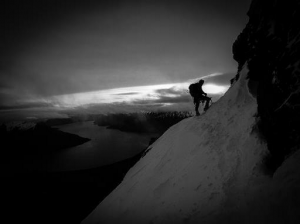 This involved crappy snow and an overhanging move that, to be honest, I probably couldn’t have even gone up second. Eric gave it a solid go and the only small bit of rock for his left crampon broke, providing him with a bit of hangtime. Luckily his cam placement held nicely. We ended up rapping down the way we came, with the last one off an average chockstone and cord, with me recalling a phone call to my poor mother: “Seriously, don’t even worry mum. Climbing is safe as”. Eric was an awesome partner, super cool under pressure and with a ton of experience. Cheers mate, learned a lot! Once off the climb we were treated to a spectacular sunset, with beautiful golden rays lighting up the Remarkables West face. The relaxing walk back across the face with the sunset was a great finish to what was an exciting and rewarding day up in the alpine! The next day out involved a full (or not) traverse of both Double Cone and Single Cone on the Remarkables, starting from the bottom of the Remarkables Ski field. Double Cone is just beautiful, and from the East face it reminded me of some of the beautiful faces I had seen in the backcountry of British Columbia. This was the day I had been looking forward to for a while. Eric and myself met an English lad named Angus going solo and we all set off together. Around the 3-minute mark it was very clear we were definitely not winning the “race” today, with the New Zealand version of Ueli Steck basically running up the hill in front while I contemplated taking off my pack to have some more gummy bears. 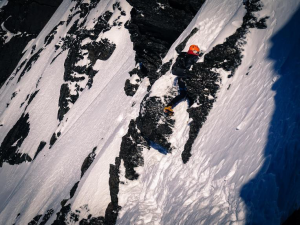 After watching the video of Ueli soloing the Eiger the week before, I was convinced I would be just as rad on the Remarks Traverse… or not. As we made our way up to the start of the ridge Eric had to turn around with a serious flu kicking in and making life pretty average. Kicking steps while coughing up blood is not an ideal day out in anyone’s book. Angus and myself made our way up to the ridge in deep powder snow, which provided a much needed thigh workout and helped burn off a bit of the Fergburger from the night before, which I could still feel taking up a significant portion of my stomach. About halfway up the ridge on the fairly exposed face we got into some deep snow that had already seen a little bit of sun. It had already softened up and going was slow, but the position was superb. We pushed on to Double Cone, had some lunch and decided to turn around at that stage, as we were just taking too long. No records were going to be broken by us today! We waited for the other 2 parties behind us to pass, but they ended up turning around with the soft snow under foot along some of the traverse making everyone a little uneasy. Down climbing some of the sections got a little spicy and focus was essential to ensure we didn’t get down to the ski field too much faster than we had planned. Taking our time walking down with the groomers we shared some great stories of adventure to finish another awesome day out! Apparently the winning time across both Double Cone and Single Cone and back to the bottom was a little over 2 hours, which is outrageous considering the conditions. Hats off to those guys, those times are seriously impressive! To finish off the trip we went for a little afternoon rock climbing just outside of Christchurch. Awesome little crag. My man-flu had come on pretty bad so I was more than happy belaying for the day and feeling sorry for myself. Eric did some really awesome trad routes and pulled off some yogi moves. The kids had some practice placing protection. The Wellington Section will have a couple of pretty epic young climbers in Felix and Sefton, which will be awesome to see! They obviously have a huge passion for climbing already and learning the trade from Simon and Carolyn I have no doubt they will go on to do some inspiring stuff in the future.